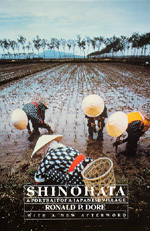 Ronald Dore offers the reader insight into the changing rural life of Japan in this fascinating study of a village some 100 miles from Tokyo where he lived first in 1955 and again in the early 1970s. A new Afterword reports on the acceleration of change to a once self-sufficient community most of whose young men now commute to city jobs instead of working the land. Dore comments on the effects of the 1993 election—Shinohata in a non-LDP-governed Japan. Ronald Dore is a Fellow of the Institute of Development Studies at Sussex and a Fellow of the British Academy. Among his many books is British Factory/Japanese Factory (California, updated edition 1990).